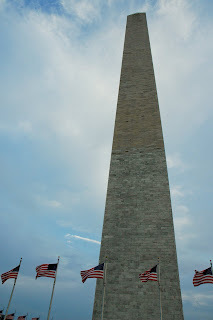 Part 1 of Vacation to Washington D.C. I'll skip Monday since that was completely traveling. 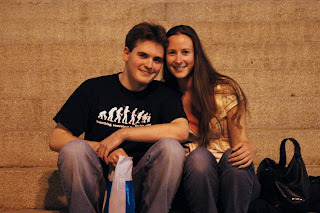 Dan & I woke up insanely early on Tuesday 7:30am EST so we wouldn't miss breakfast or the hotel shuttle to the Metro. It was on the warmer side and the humidity surely added to that. I took lots of photos at the station and got beeped at by the train for apparently being "too close." This seems to be one of the sub-themes of the trip. We got off the Metro and walked down the Mall to the reflection pool at the Capitol and took a few photos. It was pretty overcast the whole day, yet it was the best day to take outdoor photos during our visit. 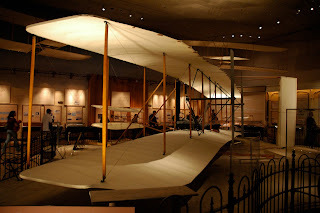 We saw a lot of the National Air & Space Smithsonian Museum. For more photos, you can check my Flickr account in the coming days. I didn't realize how small helicopters really are! Everything is under construction in D.C. because the busy season is over. The National Museum of American History was completely closed. Luckily there were a few items on display in the National Air & Space museum. I have to say my favorite part was all of the Christmas shopping I got done while at the Smithsonian's! Next we walked to the Hirshhorn Sculpture garden and then the Arts & Industry building. Sadly the latter was closed so I just took photos from the outside. 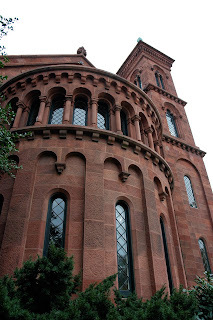 The Smithsonian Castle was my favorite building that I saw on this vacation. We went inside briefly and saw the tomb of James Smithson, the man who founded the Smithsonian Museums. Every building has security with X-ray machines so we didn't go in to see much of the Castle. My dad is a huge coin buff so I thought it would be really cool to go the Bureau of Engraving & Printing. Apparently in the off season, they close at 3:30pm. We happened to arrive at 4:05pm. Oh well! 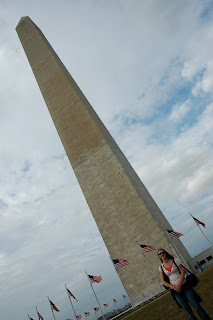 Continue on to the Washington Monument and had Dan take this photo. We didn't go up into it because it was later in the day and we still had lots to see. 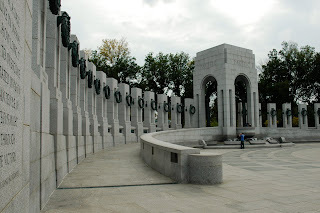 Since we could see it from the Washington Monument and still had time to kill before meeting up with Jen & Bill, we decided to continue on to the amazing World War II Memorial that was just completed in 2004. I can't believe how long overdue it was! 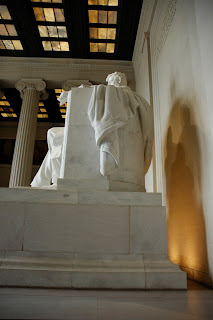 We continued on to the Lincoln Memorial where I took lots of photos. I decided to challenge myself by capturing D.C. from a very different perspective. This caught my eye. I wish I had a pedometer while in D.C. so I could tell you we walked something crazy like 9 miles per day! 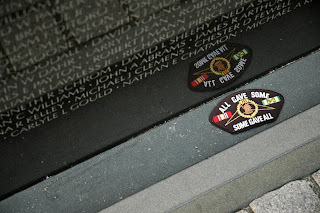 On the way back, we stopped at the heart wrenching Vietnam Memorial. 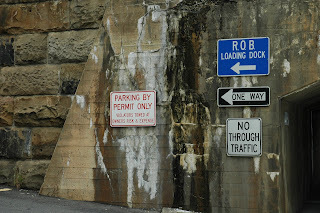 I couldn't believe the amount of photos, patches, letters, and stories all over the place. It definitely touched me the most of all the memorials. We walked back to the closest metro station and then met Jen & Bill in "Chinatown." 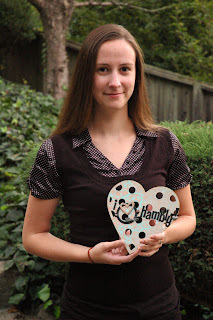 I adore this incredible "I Love Hambly" heart that Jen made for me. We had a non-stop laughter filled dinner at Clyde's Restaurant. I love how great our waiter's personality was. Not one dull moment! Thanks for an amazing night Jen! 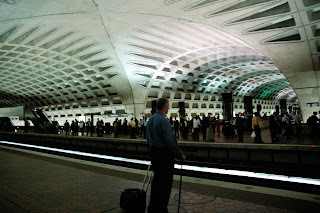 Dan and I got on the metro, then had to run to transfer to the next metro which doors were closing before we got there. Luckily, some guy let the doors close on him which made them reopen and allow us to enter. Once we got to our stop we had to run through the station to make it to the last hotel shuttle of the night at 10:45pm! I'm so happy I ran the whole way because the driver was about to leave without us. This is the beginning of the true theme of our vacation. I hope to make some sort of album, so maybe it will be called Just Keep Running! And until my next post, I leave you with a random texture picture that I took in D.C.
...and running and running and running. lol MJ Looks like you had a blast!! 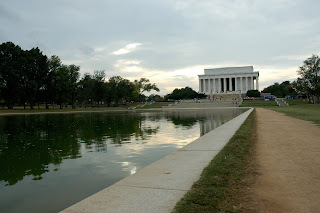 I absolutely adored DC when I was last there. It's too bad you guys didn't make it down to Arlington. I spent at least an hour or more watching the routine at the Tomb of the Unkonwn Soldier. Loved Loved Loved the Smithsonians..sooo very much to see and do I swear you need a month! Well, I'm gonna enjoy reading your blog over the next few days!! I LOVE that photo of the Lincoln Memorial!! I love the three shadows on the wall. Very cool! And isn't DC just the greatest!! I have been there probably 4 times, and just love it. Did you guys get to go to the Hollocaust Museum? That is a heartwrenching museum. 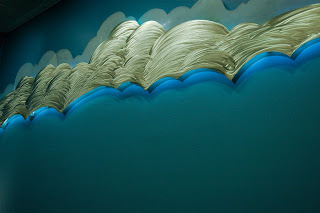 But, so interesting as well. Have a good nite!!! Loved all the photos! Oh - and the quote on my blog today is from "Mission Impossible"! wow!! sounds busy and fun all at the same time!! Really cool pics, too..=) and to answer some Q's you left on my bloggie: The walnut ink I use is crystalized..I used to get it in a jar from 7 gypsies, but mnow I'm not sure what brand I use..you could use the Range stuff, same thing..only I like the crystals because you can control how dark or light the mix is..=) it's fun stuff...And I do say "eh"..lol..only not alll the time...my boyfriend always makes fun of the way I say "about", too..he says I say it like "aboat"..lol..must be Canadian, I guess...he he....and we do have a freakishly crazy amount of things in common......lol..
Can't wait to read more abut what you guys got to do. I'm so glad the pic of you and Dan came out so well! Of course I heart the hambly picture lol! Goodness girl! You must be exhausted!! But it sounds like you had a great trip, and you got lots of great photos! Now go take a nap, and feed yourself some comfort food... Sometimes we need a vacation from our vacation! Lol. looks and sounds like you had a blast. It seems like we haven't talked in forever. We've both been on the go so much. Perhaps we can catch up Sunday.